What defines a president? Is it policymaking? A good relationship with the American people? Or is it legacy? Most would argue that legacy imprints a president in the American consciousness. A president's federal judicial appointees may be his or her most lasting political legacy. Because federal judges serve for life, their legal policymaking endures long after a president's term in office is over. Presidents who care about serving their mandate, who desire to maximize their policy agenda, and who wish to influence the nation's constitutional fabric appoint as many federal judges as possible.This new volume in the Presidential Briefings series shows how the president's appointment power has expanded beyond its bare constitutional outlines. In exercising their constitutional powers while paying heed to political opportunities, presidents and the Senate have together created our modern judicial appointment politics. 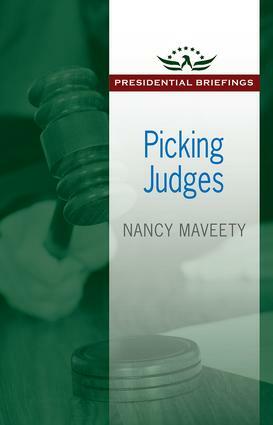 Presidents consider a host of demographic and ideological factors, candidate qualities, and electoral politics.Nancy Maveety examines the dynamics of screening and choosing judicial nominees and analyses the institutional calculus in securing their confirmation in the face of senatorial obstruction. Maveety shows how a president can adapt to particular circumstances and provides an outline for synergistically staffing the federal judiciary, thus securing a legacy for all time.